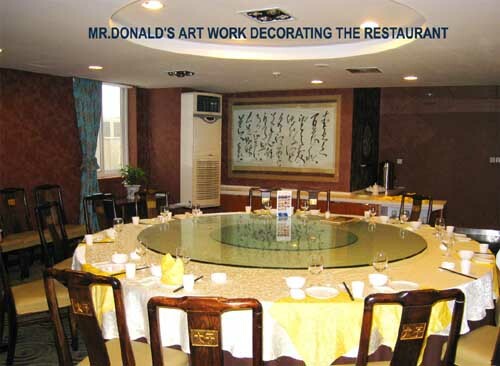 THE STREET OF "THE ACADEMY GATE "
YOUR FOOD & TRIP GUIDE IN XIAN,CHINA. 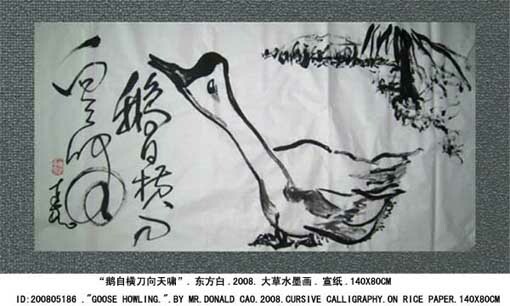 The Cursive Script Calligrapher was born in Xian,<?xml:namespace prefix = st1 ns = "urn:schemas-microsoft-com:office:smarttags" />China and began to learn Chinese calligraphy from 6 years old.His art theory of "Chinese Calligraphy Standard" becomes the level standard of this line. 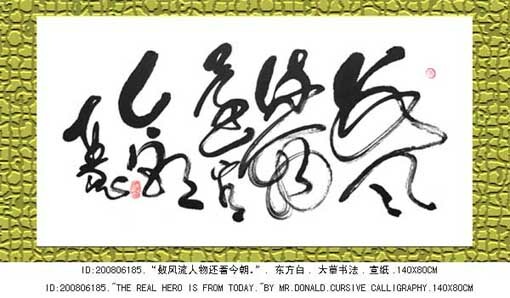 Mr.Donald Cao is the chief artist of Chinese Cursive Hand (Cao Shu) Calligraphy which is at the top level contains the distillate of all Chinese Calligraphy Styles.His great-grand father was the founder of Xian Beilin-Forest of Stone Tabliits Museum & the leader of Public Revolution in Xian.His art works of "Cao Shu"(Cursive Script) and "Xing Shu"(Semi-cursive Script) are treasured up by collectors from China and abroad.He is also a teacher can explain in English the wonderful "brush art world" of typical Chinese Calligraphy & Paiting.WWW.ESHOWART.COM is his art web which is finding dealers from all over the world. 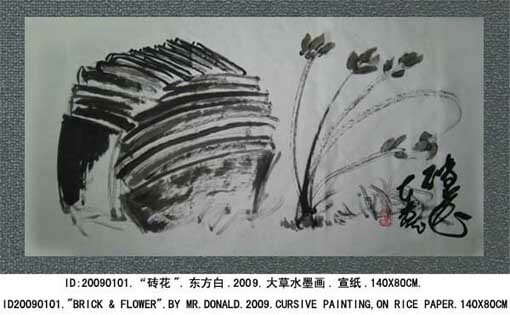 2008 CACF Art Show in Xian. 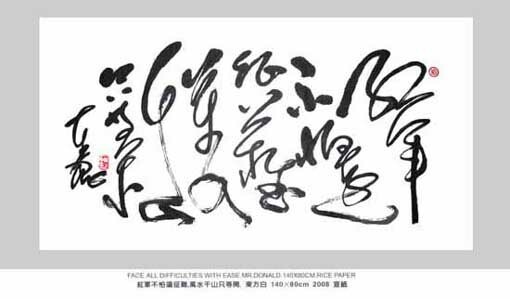 "INVITE THE MOON AS MY THIRD FRIEND IN FALL" ---CHINESE POEM OF TANG DYNASTY ---CURSIVE HAND CALLIGRAPHY BY MR.DONALD CAO ---PEOPLE EHJOY THE MOON WHEN MID FALL FESTIVAL COMES IN CHINA. 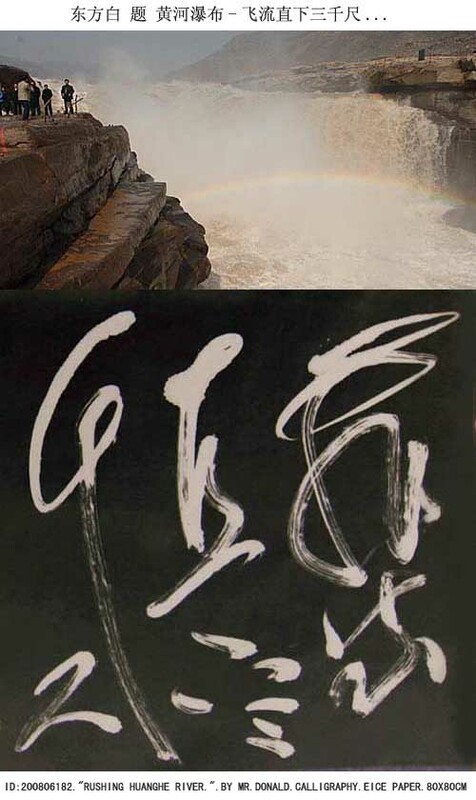 CHINESE MOTHER RIVER-HUANHE COMES FROM THE SKY TO THE SEA. 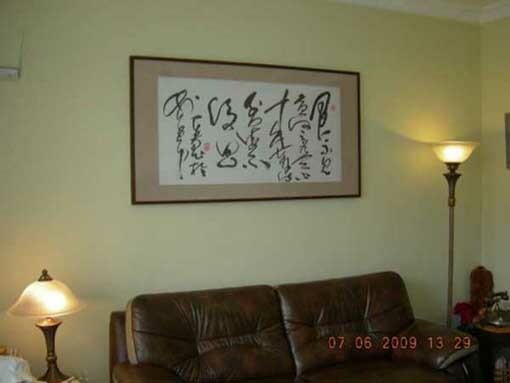 THE CALLIGRAPHY EXPRESSES OUT THE FORM OF THE GREAT RIVER. 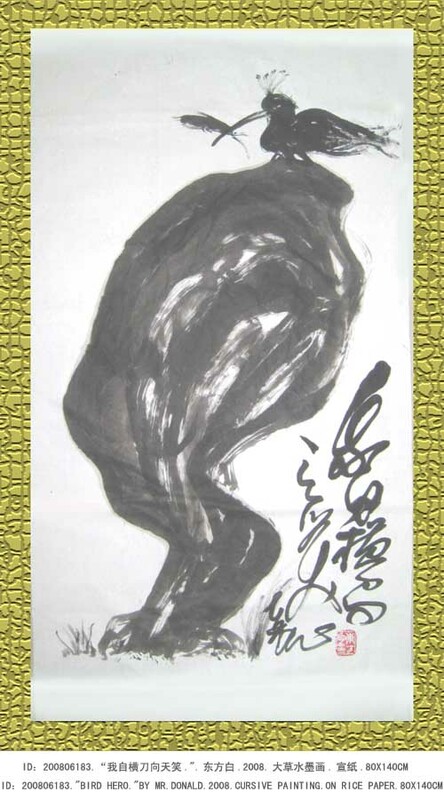 Enjoying Point: (A)By using brush in cursive and fast way,it one time forms the rhythm changes of ink lines and paper spaces divided as well as impressional images like people running,stones falling ,cloud flowing,snake jumping,birds dancing and stars spreading in the sky etc.. (B)By brush moving,the Ink Color keeps changing from shallow to dark(5 Ink Colors) & wet to dray. 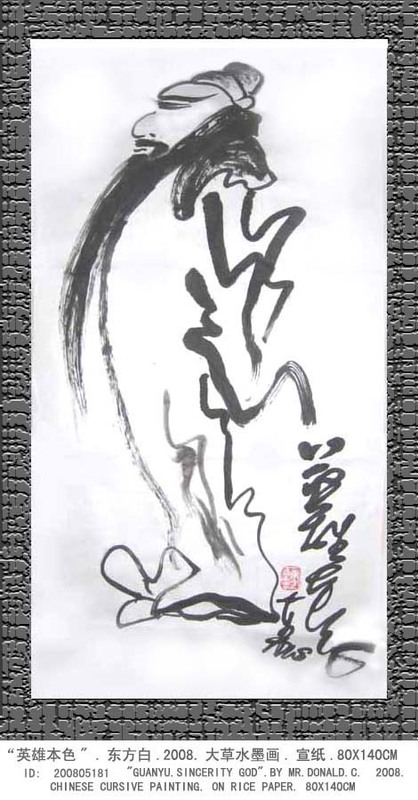 (C)Most Ink Lines are created by the soft brush but keeps in the mid posotion in moving so as to express solid feeling of the ink line. (D)In every row,you can find the ink area is strictly balanced although the ink line jumps from the left to the right.It speaks for the philosophic theory of transform between moving & still. 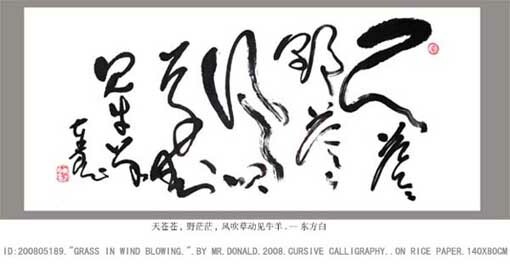 "FACE ALL DIFFICULTIES WITH EASE" ----BY MR.DONALD'S CURSIVE HAND CALLIGRAPHY AT THE TOP LEVEL CONTAINS THE DISTILLATE OF ALL STYLES OF CHINESE CALLIGRAPHY. ---CHINESE FIRST PRESIDENT CHAIRMAO'S POEM. 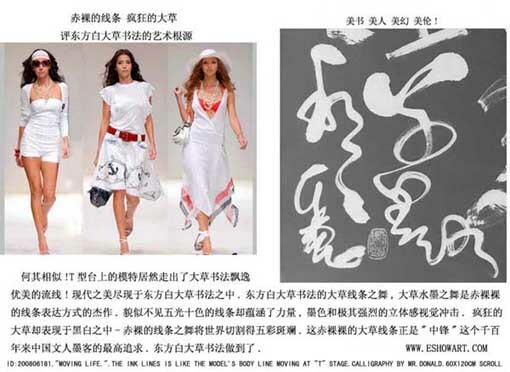 ---THE INK LINES AND THE SPACES DIVIDED FORMS THE FALLING IMAGE TO EXPRESS THE SOCIAL'S TREND TO COVER ALL OBSTACLES WHEN THE PUBLIC REVOLATION HAPPENED. 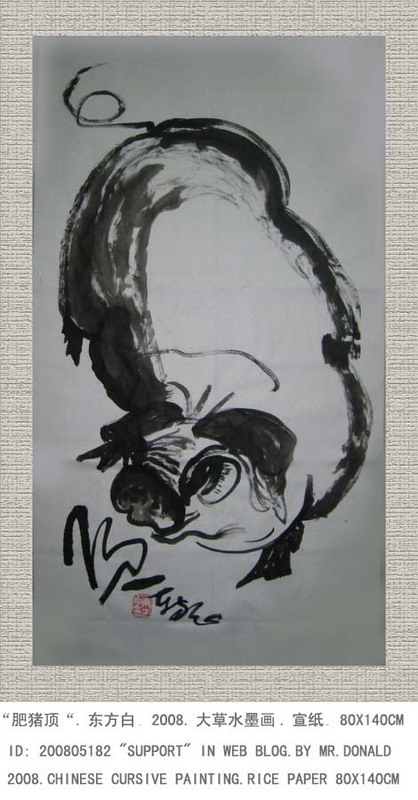 ---THE CONTINUOUS AND SOLID INK LINES LOOKS LIKE BIRDS FLYING,LION CRYING,DRIED TREES,ETC.THE IMPORTANCE IS ,IN EVERY ROW,THEY ARE CREATED IN BRUSH MOVING AT ONE TIME. "THE FALL IS LIKE SILVER RIVER DROPPING FROM THE SKY." 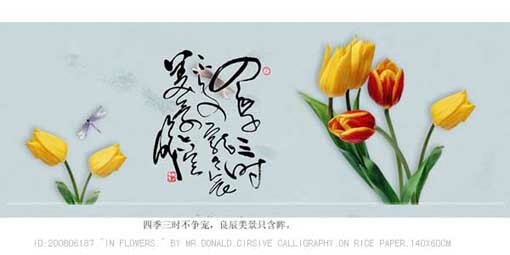 ---CHINESE POEM OF TANG DYNASTY ---CURSIVE HAND CALLIGRAPHY BY MR.DONALD CAO .